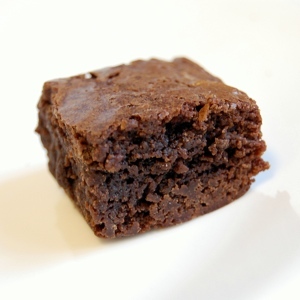 I am more of a blondie man than a brownie man, myself, but my girlfriend likes brownies. 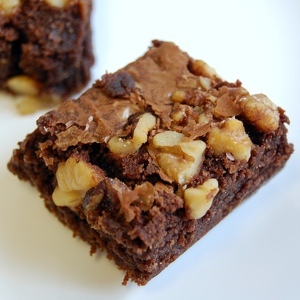 So here are some brownies. The recipe I used said to use pecans, but I used walnuts. I just sprinkled as many as seemed reasonable on top of one half of the brownie batter once the batter was in the bake pan, and just pressed down on ’em a bit. 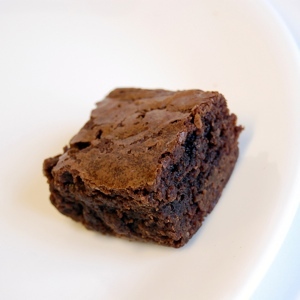 The brownies also came out of the oven after 33 minutes, which is the minimum time in the recipe, because the gooier the better. Also, I used a microwave instead of a saucepan on low heat to do my butter and chocolate melting. I think I’ll save the saucepan for the fancy brownie recipe, when I want to spend more than 10 minutes in preparation. I changed the ratios, too, of the sweet vs. semi sweet chocolate, based on what was in my cupboard. There were certainly no complaints about too much sweetness, though. In fact the official verdict was, “Perfect,” so huzzah. 1. Preheat oven to 350 degrees. Line an 8 or 9 inch square bake pan with non-stick foil. 2. Melt most of the butter in a microwave. Add in the chocolate, and continue melting, but take it out and stir it occasionally. Don’t melt it all the way in the microwave – there should still be a few small chunks of chocolate that will finish melting from the residual heat of the butter and the other melted chocolate. Let cool. 3. Whisk the eggs in a mixing bowl. Add in and mix salt, both sugars, and vanilla. Add and mix in chocolate. Fold in/mix in flour until just combined. 4. Pour batter into bake pan. Sprinkle walnuts or pecans on top if you want. I like to press down on them a bit so they don’t fall off the finished brownies. 5. Bake for 33-35 minutes, until the top just seems to start cracking. Cool in pan on a wire rack for 10 minutes. 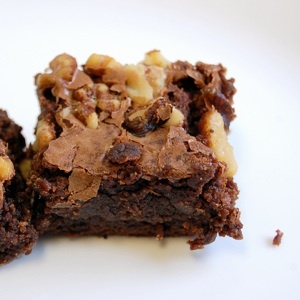 Cut into individual sized brownies, as small or as big as you want. But bigger brownies taste better.